class="archive tag tag-poultry tag-140 group-blog masthead-fixed list-view full-width wpb-js-composer js-comp-ver-5.7 vc_responsive"
Iowa State University researchers concluded from a long-term field study that poultry manure, when applied at a rate to meet crop nitrogen (N) requirements, can reduce nitrate loss and achieve equal or better yields in corn-soybean production systems. This research effort, Long-term Effects of Poultry Manure Application on Nitrate Leaching in Tile Drain Waters, evaluated tile drained field plots over 12 cropping seasons. While this research focused on nitrate (NO­3-N) loss by field-tile drains (typically placed 3 to 6 feet deep), similar trends would be anticipated in Nebraska for nitrate leaching below the crop root zone and the eventual impacts on ground and, possibly, surface water quality. The research team evaluated four N treatments, including poultry manure application rates of 150 lbs N/acre (PM150) and 300 lbs N/acre (PM300), urea ammonium nitrate (UAN) at 150 lbs N/acre (UAN150), and a control at 0 lbs N/acre (Control) on a tile-drained field near Ames, Iowa from 1998 to 2009. Manure and UAN were typically applied on the same day, typically between mid-April and mid-May. The research was conducted in loam soils with organic matter averaging 3.4% in the top 12 inches. Nitrate-N loss was measured from mid-March to October. Take Home Message: Poultry manure applied at agronomic rates reduces loss of nitrate from the crop root zone as compared to commercial fertilizer and over application of manure. 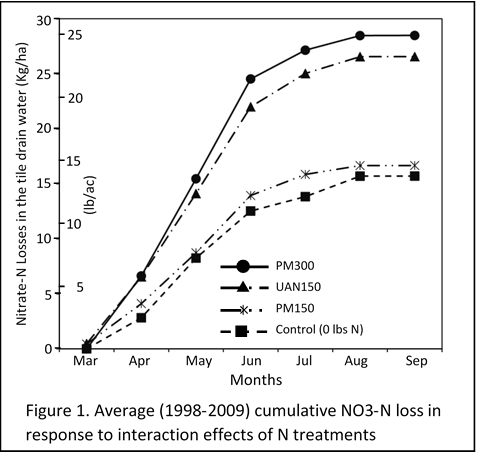 Average cumulative nitrate-N loss for the UAN150 treatment was significantly greater than nitrate-N experienced by the PM150 treatment (Figure 1). 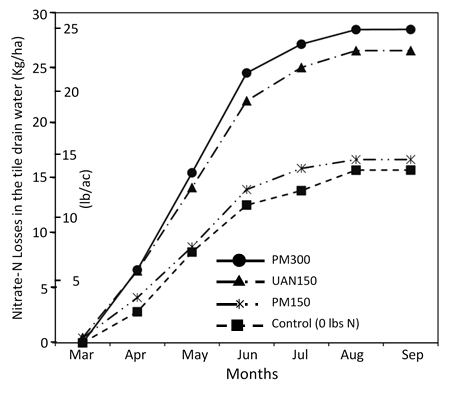 In addition, over application of animal manure (PM300) increased nitrate-N movement to tile drains more than an agronomic rate of commercial fertilizer (UAN150) or manure (PM150). Nitrate losses were highest from March through June (periods of low evapotranspiration rates and high precipitation) and lowest from July through September (low precipitation, higher evapotranspiration, and deeper root zone). Slow release of N stored in manure’s organic matter results in N release later in the growing season. Rapid soil microbial growth resulting from manure’s carbon (energy for microbes) immobilizes nitrate-N early in the growing season. This microbial N is released later in the crop growing season. Improvements in soil properties including water stable soil aggregates and cation exchange capacity hold soil mineral N in place. Take Home Message: Poultry manure demonstrates equal or greater yields than commercial fertilizer when applied at similar N rates. Table 1. Average crop yields1 as a function of N treatment, based on 12 crop-years for corn and soybeans. 1Corn and soybean yields corrected to 15.5% and 13% moisture, respectively. 2Values followed by the same letter are not significantly different. The 12-year evaluation period produced results commonly expected for movement of water to tile drains. Distribution of rainfall during the growing season impacted both water flow and nitrate concentrations. For example, higher than normal precipitation during April and May resulted in higher than normal tile flow volumes, nitrate concentrations in tile flow, and nitrate losses. Wet and dry cycles of weather conditions also influenced annual tile drain water volume and nitrate losses. Limiting the nitrate-N pool in the soil during the spring (when water movement beyond the root zone is common) is important to protecting water quality. Animal manure can achieve this outcome. Does This Apply to Nebraska? The general trends observed by this Iowa study would be expected for leaching losses of nitrate-N from Nebraska corn and soybean fields. Risk of nitrate-N losses is highest prior to planting and during the early growing season. Low evapotranspiration rates, higher precipitation, and the presence of nitrate-N is a recipe for N loss in drain tiles in Iowa and leaching to groundwater in Nebraska. Similar results are also anticipated for most animal manures. Most slurry and solid manures store much of their N in a slow release organic form and supply sufficient carbon for rapid soil microbial growth following manure application. These properties are important to a fertility product with less risk of N leaching.